Josh Cormany was born and raised in Surf City USA, Huntington Beach California. Josh has been in the large format industry since 1997 where he started as a driver for a supply company who dealt with architects and engineers. After Josh got injured playing football he moved into the job market, quickly moving from driver to warehouse manager to sales rep to sales manager. He has had a deep passion to help other companies develop new marketing strategies with the use of wide-format technology. Josh was able to learn the wide-format color market which was just starting to get big with the development of the HP-2500CP back in the late 90’s. It didn’t take long for Josh to succeed in that world since he was so fascinated by it and would spend all his free time learning about how these machines worked and what they could do for his clients. Josh targeted every big company like Warner Brothers, Universal Studios, and Nike. After a while the people he worked with would call him Bigfish because he always went after the big companies in the industry. He is a huge fisherman as well so the name stuck with him and he is commonly referred to as Bigfish. Many clients from all over the world have been able to network with Josh as he has one of the most widely known web presence out there for the Sign and Graphics industry. 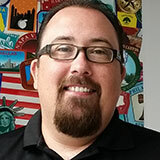 Josh’s Specialties include: Latex, Solvent, and Aqueous Inkjet applications and product development. He has also worked with Vistage/The Executive Chair for multiple years training with some of the biggest CEO’s in the United States. Josh is a pioneer in the materials industry and is always striving to bring new materials to market that will help generate higher profits for his customers.